1917 Wedgwood Calendar Tile with the United States Navy Yard in Boston on the face, and the 1917 calendar on the reverse. 33 Franklin St., Boston, U.S.A. In 1917, President Woodrow Wilson, re-elected on the claim that 'he kept us out of war,' led the United States from neutrality into war. Vladimir Lenin, living in exile in Switzerland at the beginning of the year, led a Russia at the end of it that had laid down its arms and was negotiating a separate peace, the great fear of France and Great Britain, with Germany and Austria-Hungary. When Allied military and political leaders met in Rome in January 1917 to coordinate plans for the coming year, a new commander of French forces on the Western Front, General Robert Nivelle, was at the table. President Raymond Poincaré had pushed General Georges Joffre out, replacing him with Nivelle, who had risen to prominence with his re-conquest of nearly all of the land lost to German forces in the 1916 siege of Verdun. Nivelle claimed to have discovered the secret of victory, and planned a spring offensive, as did British Generals Robertson and Douglas Haig. British Prime Minister David Lloyd George opposed an offensive in France, had little faith in his generals, and was maneuvering to bring them under greater control of his government. As it became clear that he could not prevent the Conference deciding in favor of spring offensives, he managed to subordinate Robertson, Haig, and British forces to Nivelle. After its punishing losses at the Somme and defeat at Verdun in 1916, Germany sought victory by strengthening its defenses on the Western Front, and by defeating Britain by starving it of food and supplies. Germany returned to unrestricted submarine warfare on January 31, 1917: all shipping in the war zone around the British Isles would be sunk on sight. In April, Germany first achieved its goal of sinking one million tons of shipping each month. The same month the submarine campaign also realized the fear of Reich's Chancellor Bethmann-Hollweg when the United States declared war on Germany. With the submarine war underway, and expecting an Allied Spring offensive, Generals Paul von Hindenburg, and Erich Ludendorff executed Operation Alberich, a strategic retreat to a shorter, stronger, more advantageous defensive line on the Western Front. Having constructed new defensive lines, on March 15 and 16 German forces completed falling back to a system of four defensive lines after having destroyed anything that might be of value to the Allies. Orchards were felled, wells poisoned, structures destroyed, high points like steeples demolished, and booby traps left behind. The Germans shortened their front line by nearly 30 miles. Although the number of German Divisions had been increased from 183 to 238, the country was drawing upon a less robust pool of men including convalescents and 17-year-olds, many undernourished. Desertion and lack of discipline were increasing problems. At the beginning of 1917, the Russian army was better equipped than it had been, but discipline was breaking down. Transport failed to meet military or civilian needs, leaving major cities short of food during the winter. Food riots and strikes led to mass demonstrations in Petrograd on March 8 (February 23 Old Style) and 9, and to a three-day general strike the next day. After 60 marchers were killed by soldiers on March 10, the Volinsk Regiment came out in favor of the demonstrators. Nearly all Petrograd garrisons soon joined the revolt, which grew from 660 soldiers on March 11 to 170,000 on the 14th. Seeking leadership, demonstrators and soldiers marched to the Duma, the Russian Parliament, which formed a provisional government. Tsar Nicholas abdicated on March 15. The February Revolution removed the Tsar from power, restored the Duma, and brought a government that included moderates and liberals to power, but a government committed to keeping Russia in the war. Simultaneously, Socialists, Social Democrats, Social Revolutionaries, Mensheviks, and Bolsheviks followed the model of the 1905 Revolution and formed a Soviet, asking factories and barracks to send representatives. Duma and Soviet had an uneasy power-sharing in the coming months. Russia had planned a spring offensive, but the turmoil of the revolution brought activity on the front to a standstill. The overthrow of the Tsar freed up German troops for redeployment from Russia to Italy and France. The overthrow of the Tsar in Russia, which could free German units for transfer to the Western Front, the German retreat, which shortened the German line, concerns voiced by his generals, the war's two-and-a-half-year record of failed offensives all made little impression on General Nivelle or led him to rethink his offensive. Neither military nor political leaders believed Nivelle’s plan would work. But when on April 6, Nivelle gave his government the option of approving his plan or accepting his resignation, the politicians approved the plan. Having replaced Joffre only months before, they shied from replacing Nivelle. Nivelle hoped, as others had before him, his spring offensive would lead to a breakthrough. A short, violent artillery barrage would be followed by massive forces attacking and breaking through the enemy lines. Cavalry would then exploit the openings resulting from the attack to get behind the enemy and his defenses, encircling him or moving on to seize strategic objectives. Nivelle expected his breakthrough in 24 to 48 hours. 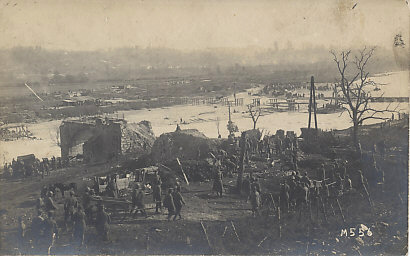 Like Joffre's 1915 Champagne-Loos-Artois Offensive, Nivelle's plan entailed offensives in both Artois and Champagne, the first by the British along a front east of Arras, and second a week later by the French at Chemin des Dames, the high ground above the Aisne River. Nivelle expected the British attack would draw German reinforcements from the sector to be targeted next. Under General Edmund Allenby, the British attacked on Easter Monday, April 9, east of Arras along a 20 mile front, with significantly greater artillery support than on the Somme a year before. They met with some initial success, but losses mounted over several days. They continued to try to break through in the same sector, as the defenses strengthened. At the northern end of the British line, the Canadians attacked at Vimy Ridge, and in two days seized the Ridge that had cost the French thousands of casualties in the previous years. As the Artois offensive continued, Nivelle attacked on April 16 in Champagne in the Second Battle of the Aisne — the Battle of Chemin des Dames — with 1,400,000 French troops in 52 divisions under General Franchet d’Esperey. With the Aisne River behind them, his troops tried to climb steep, difficult, wooded terrain to reach the high ground along Chemin des Dames — the Ladies' Road — between Soissons and Reims. The artillery had given the defenders ample warning of the attack. The high ground was strongly defended and a warren of caves where the Germans sheltered, until emerging to fight, sometimes behind advancing French troops. Even where the French where successful, there was higher ground beyond. The assault failed and the Germans held a line on the Ailette River. In Artois, the British suffered 150,000 casualties; the Germans, 100,000. At Chemin des Dames, the French suffered 120,000 casualties, 30,000 of them dead. The French took 28,000 German prisoners. On May 3, French troops in some of the units that had suffered the greatest casualties during Nivelle’s offensive began mutinying, mutinies that spread to 16 army corps in four armies, and that led to civilian sympathy strikes. On May 15, the government of Alexandre Ribot, in power for barely eight weeks, replaced Nivelle with General Henri Pétain, who had commanded the defense of Verdun. On May 19, 1917 Pétain issued his Directive No. 1: the French Army would suspend 'large scale attacks in depth,' of the kind Nivelle had just conducted; France would await the Americans who had declared war on Germany one month before; the French would end unlimited offensives. With these assurances came the stick: Pétain also courtmartialed over 100,000 soldiers, of whom 22,000 were found guilty, 432 sentenced to death, and 55 officially shot. Others may have been without official sentence, or, according to the novelist Henri Barbusse, killed by artillery. Pétain also sought to address some of the soldier’s grievances and improved conditions. He would 'wait for the Americans and the tanks', paths to victory. The last of the serious mutinies ended in June. The wait for the Americans would be longer. 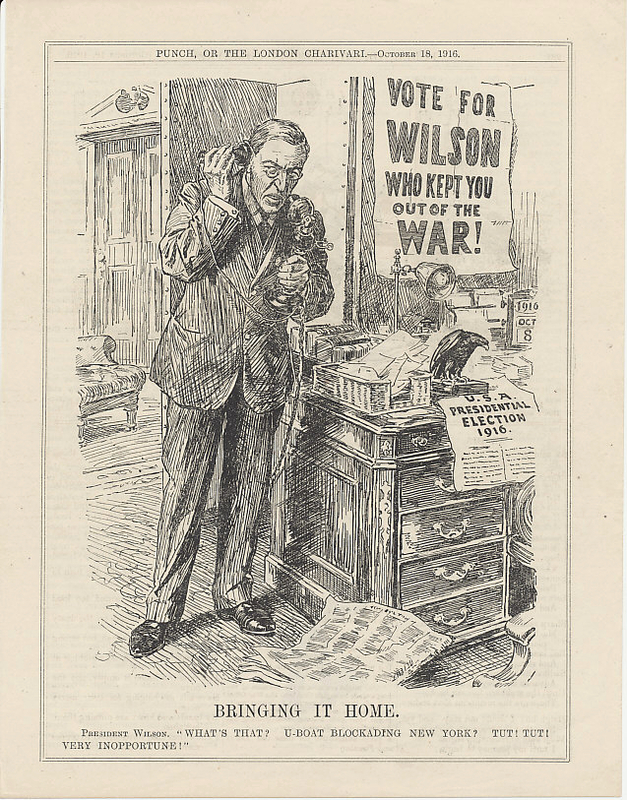 In November 1916 Woodrow Wilson won re-election as president of the United States on the basis that he had 'kept us out of war'. The country had maintained its neutrality. There was a great deal of support for Germany from German-Americans and from anti-British Irish-Americans. 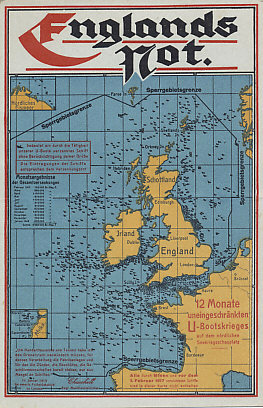 Many opposed Britain's blockade of Germany on commercial and humanitarian grounds. The US Government opposed the blockade as a violation of international law. But Wilson had also said the United States would break relations with Germany if it resumed its campaign of unrestricted submarine warfare. America's neutrality allowed it to do business with the combatants, but the blockade limited access to German markets. The General Electric company shipped submarines to Canada for transfer to Britain. From the beginning of the war, Germany complained of American raw materials and finished goods being shipped across the Atlantic and Pacific to the Allies. Although both sides claimed many of the American shells were duds, German agents had conducted a sabotage campaign to end the traffic. The January 31 declaration of unrestricted submarine warfare began to turn the country to intervening. The sinking of Lusitania with the loss of 128 Americans had led to the restriction of the German campaign, but not its end. Americans lives, in smaller numbers, continued to be lost. America continued to protest. When war began in 1914, Great Britain had cut Germany's transatlantic cables. Germany's communications with its diplomats around the world, including those in America, traveled over British cables. The Germans were confident in their encryption. The British, who monitored cable traffic, had German code books. On January 19, the German Secretary of Foreign Affairs Alfred Zimmerman sent what would become known as the Zimmerman Telegram to Germany's ambassador in Mexico. Intercepted by both the British and Americans, the telegram announced the new submarine war, hoped America would remain neutral, but offered Mexico an alliance in the case of war. Should war occur, Mexico was to 'reconquer the lost territory in New Mexico, Texas and Arizona.' Mexico was further to act as an intermediary between Germany and Japan. On February 28, the note was made public. Although the note was contingent upon a state of war between Germany and the United States, the American public turned against Germany. On April 2, President Wilson brought a declaration of war to Congress. Four days later, on April 6, Congress passed it. America was not prepared for war, but turned quickly. As of April 19, resident aliens were required to register with their local police. Conscription was passed on May 18. The United States began building an army and ships, Liberty Ships, ships for convoys, transports for troop and supplies. In Russia, the moderate Socialist and Justice Minister Alexander Kerensky had taken the post of Minister of War, and encouraged a Russian offensive which began in Galicia, in northeastern Austria-Hungary in June. Commanded by Alexsei Brusilov who had commanded Russia's great offensive of 1916, the attack began well, but the army was disintegrating. Orders were countermanded by votes of committees that included soldiers and political commissars. Orders to advance were delayed to allow for debate and votes that sometimes affirmed the advance and sometimes countermanded it. Votes to advance were reopened for discussion and new votes to to advance or retreat. Soldiers left the front. By early July the offensive had failed disastrously, with over 200,000 Russian casualties. It was the last major Russian military initiative of the war, and led to demonstrations and work stoppages. The Government, and the generals, blamed the Bolsheviks and would soon turn against them. By early 1917, Central Power forces had conquered most of Romania, and confined what remained of the Romanian Army to Moldavia, Romania's northeast region, where Romanians and Russians held a line extending to the Black Sea. Even as Kerensky's Offensive was failing, what remained of Romania's army and the Russians launched an offensive in Moldavia against the German Ninth Army. The Battle of Mărăşti began on July 24. 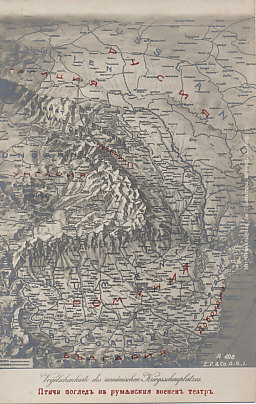 Although the Romanians captured Mărăşti, the Russians were driven back to their north. The Romanians suspended operations on August 1. One week later, on August 8, the German Ninth Army struck back in the the Battle of Mărăşeşti, on the Sereth River. With the Russians retreating to the north, the Romanian First Army took their place in the line. On August 10, the Romanians and Russians counterattacked. On August 19, the Germans attacked again, the Romanians counterattacked, and the Germans retreated in disorder. The Battle of Mărăşeşti was the greatest Romanian battle and victory of the war. In the battle, the Romanians suffered 27,410 casualties, of which 5,125 died, 12,467 were wounded, and 9,818 were missing in action. Central Power casualties were 65,000. Launched the same day as the Battle of Mărăşeşti, on August 8, the Battle of Oituz was a Central Power offensive to take heights along the rivers of Moldavia. The General Gerock Group — consisting of German and Austro-Hungarian divisions — attacked units of the Romanian Second Army and Russians. The Romanians held. On August 19, the Austro-Hungarians resumed the attack. Romania's fate was sealed by events in Russia, first on the battlefield, where Russians increasingly concluded local ceasefires, and in Petrograd, where a new Russian government would take power. Romania concluded an armistice on December 9. The peace treaty — the Treaty of Bucharest — was signed on May 7, 1918, but by a new government, not by King Ferdinand of Romania. After Kerensky's failed offensive, Germany continued to advance into Russia. Many blamed the Bolsheviks for the disintegration of the army and accused the party of being in the pay of Germany. The Russian people were both anti-German and anti-war, and the most consistent voice calling for an end to the war was Vladimir Lenin of the Bolsheviks. Workers and soldiers marched to the headquarters of the party demanding action against the government, but the Bolsheviks were unprepared for a revolution. The government then turned on the party, imprisoning members as Lenin and others fled. Germany's advance threatened the capital. General Kornilov, who had been a commander in the summer offensive, attempted to rally troops to overthrow the government, while negotiating with Kerensky. Fearful of a coup, the government released the imprisoned Bolsheviks and armed them to defend the Petrograd. Kornilov's scheme came to nothing. The Bolsheviks remained free and armed. As the government prepared for a constituent assembly to form an elected government, the Bolsheviks called for the transfer of power to the Soviets, in which the party was increasing its representation. When the government moved against the Bolsheviks on November 6 New Style, it was already too late, as the Bolsheviks controlled bridges, railway and power stations, and the telephone exchange. On November 8, the Second Soviet Congress met, and Lenin proclaimed an end to the war. The first phase of the Bolshevik Revolution had ended. The Russian Civil War would soon begin. With a ceasefire established, representatives of the Central Powers and the new Bolshevik Russian government met in the Russian city of Brest Litovsk for peace talks that continued into the 1918. Most of the new government disagreed with Lenin's demand for an immediate peace, a demand that was only agreed to after Trotsky and the Russian delegation walked away from the peace negotiations, and Germany resumed its advance into Russia. Russia and the Central Powers finally signed the Treaty of Brest-Litovsk on March 3, 1918. The ceasefire on the Eastern Front freed up German forces not only for the Western but also for the Italian front. With Pétain’s decision to forego major offensives while waiting for tanks and Americans in great number, British General Haig finally found himself not needing to coordinate with or subordinate himself to the French. He chose to use his new freedom to mount an offensive in the reclaimed marshland of Flanders near Ypres. Just beyond the Allied lines in Belgium manned by the British, lay the port of Ostend, home to some of the German submarines that had sunk a million tons of shipping in April. Capture of the port was one of the goals of a plan Haig had presented at a May 7 inter-allied conference in Paris. Neither Foch nor Pétain saw much prospect for success. The site for Haig's offensive was reclaimed marshland, low-lying, and drained for farming. The war had damaged the land's drainage system, and Allied bombardment would destroy it. The rains that came every August would turn the land's heavy clay to mud. 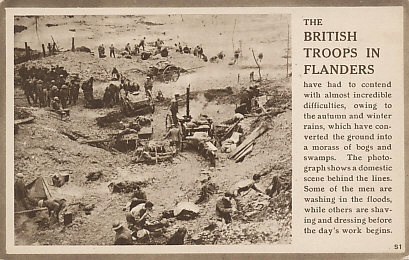 From higher ground, German forces could observe the British preparations. Some of that high ground, that of Messines Ridge would soon be leveled. At 3:10 AM on June 7, 1917 residents of London and a student in Dublin felt the explosions that brought down Messines Ridge in Belgium, south of Ypres. For over a year British, Australian, Canadian, and New Zealand miners had tunneled beneath the ridge, and had packed explosives into chambers. Nineteen explosions lifted and brought down the ridge. For a time, British troops rapidly advanced against the stunned defenders. Despite the loss of the Ridge, Haig’s preparations were in view in the flat landscape, and the Germans had ample warning of Haig's coming attack, and launched an attack at the coast on July 10, 1917, taking some territory. But Haig pushed on, and soon began two weeks of bombardment — 4,500,000 shells from 3,000 guns — that eliminated any element of surprise that might have remained. The bombardment caused an estimated 30,000 German casualties. On 31 July, Haig unleashed nearly 1,000,000 men against a comparable number of defenders to begin the Third Battle of Ypres, the Battle of Passchendaele. His artillery barrage had helped destroy the drainage of the land across which his men were intended to advance. By August 4, the rains had begun, and the land turned to mud, mud that got into weapons, and in which men and horses got stuck, some of them drowning. Rain fell from July 31 to August 6. A further effort on August 16 failed, as did one on August 21. Replacing his general, Haig saw some success in September in attacks on September 20, and 26. The British launched further attacks on October 4, and 12, and 22, and 26, and 30 with battles for Passchendaele on October 12 and 26. With its Italian ally collapsing before the Austro-Hungarian offensive in the Battle of Caparetto, Britain transferred five divisions to Italy, and began winding down the offensive. The Third Battle of Ypres, or Battle of Passchendaele, ended with the British taking the remains of that village on November 6, 1917. The battle, the conditions under which men fought, the casualties, all shook British morale. For the first time in the war, Germans found the British surrendering easily. The costs were high on both sides; the British suffered over 300,000 casualties, the Germans 200,000. In an attempt to demonstrate some success in 1917, Haig tried to take the communication center of Cambrai, France on November 20, with the first great tank offensive. Along a six mile front, six British infantry divisions followed 380 tanks into battle. Critical to the success of the tanks, the weather and land were dry. With no preliminary bombardment, the first indication the German defenders had of the attack was the massive tanks lumbering towards them. The British took 10,000 Germans prisoner while suffering 1,500 casualties. The defenders were stunned, but Haig had neither an overall plan, nor reserves to follow-up on the initial British success. Although they advanced, the British did not capture Cambrai. The Germans have no tanks, but on 30 November, they counter-attacked with new 'Hutier tactics,' in which specialized shock troops exploited weaknesses in the defense, and bypassed areas of resistance, leaving them for other specialized troops to mop up. They recaptured most of the territory lost to the tanks, but their advance was limited as undernourished German soldiers stopped to loot. The Battle of Cambrai demonstrated the capability of the tanks, and validated General Pétain's decision to wait for them. France and Britain were building tanks. Germany and Austria-Hungary were not. Italy continued its offensives on the Isonzo River with the Tenth Battle of the Isonzo from May 12 through June 8 and the Eleventh from August 19 to September 12. In its battles of the Isonzo, the Italians had crossed the river, but had advanced only a few miles along a front of approximately 30 miles. But in the Eleventh Battle, they had at last driven the Austro-Hungarians from the high ground of the Bainsizza Plateau. Italian General Luigi Cadorna recognized that his lack of weapons, particularly heavy guns, put his forces at a great disadvantage against the Austrians. Convinced that Austria-Hungary was on the verge of collapse, Germany sought to save their ally by defeating Italy. With ceasefire on the Russian Front, they could redeploy troops to the Western and Italian fronts. Looking for a weak spot, the commanders found it at Karfreit, Caparetto in Italian, an Austro-Hungarian city on the west bank of the Isonzo. Together with their Austro-Hungarian ally, the Germans launched, on October 24, the Twelfth Battle of the Isonzo or the Battle of Caparetto, for the Italian name of the Austro-Hungarian city of Karfreit. The Italian front collapsed, falling back 70 miles to the Piave River, so quickly that German and Austrian forces could not keep up with the retreat of 1,000,000 Italian soldiers. There are 700,000 Italian casualties, 400,000 of whom deserted, 200,000 of whom were taken prisoner. In a pattern that had occurred before and would again, German and Austro-Hungarian soldiers delayed for food and the spoils of war. On the Piave, the shortened Italians held their shortened line. Italian morale rises. Cadorna was replaced by Armando Diaz who would lead the Italian army through the end of the war. Like Petain, Diaz would not strike again until his forces are ready. In one response to the disaster in Italy, the Allied statesmen meet on November 5, at the Rapallo Conference, and agree to create, on November 8, a Supreme War Council, with Foch as Chairman, and with independent military advisors to the civilian leadership. Commanding British forces in Palestine, General Murray attacked Gaza on March 26 and again in April. The British lost 10,000 men to 3,500 Turks in these failed attacks. Murray was replaced by General Edmund Allenby who had failed to achieve a breakthrough in the Battle of Arras. T.E. Lawrence, better known as Lawrence of Arabia, and the Arabs took the fortified Red Sea port of Aqaba on July 6, killing or capturing 1,200 Turkish troops at a cost of 2 killed, and securing British communications in Sinai. The Arab Revolt continued to tie up Turkish forces as the British moved along the Palestine coast, taking Beersheba in October and Jaffa on November 14. On December 9, 1917, Allenby occupied Jerusalem, entering the city on foot so as not to appear a conqueror. The victory on the Syria/Palestine Front was one of the few bright spots in a difficult year for the Allies. By early 1917, French General Maurice Sarrail had over 600,000 men under his command on the Salonica Front, many sick from malaria and other diseases. The divided government of Greece broke utterly, with its pro-German King Constantine leading royalist forces and a revolutionary government under the former Prime Minister, pro-Entente Eleftherios Venizelos with its own military. Constantine secretly mobilized his army to move against the Allied forces. Sarrail was a prominent republican and was prepared to move against the King, but Tsar Nicholas, hesitated to act against another crowned head of state. When the Tsar abdicated and was no longer a consideration, Sarrail was allowed to suppress Greek Royalist troops, and used British troops in Athens to do so. On June 11, King Constantine was forced to abdicate and went into exile. Sarrail planned a spring offensive for 1917. On the night of April 24–25, the British began an diversionary attack that came to nothing. Sarrail had delayed the offensive, but had not informed them. On May 23 the offensive began, but failed. The dispute between 'Westerners' and 'Easterners' that dated to the first months of the war flared again. Prime Ministers Ribot in France and Lloyd George in the United Kingdom were both pressed to answer for the large number of forces on the Salonica Front when they were desperately needed in France. For the most part, the French to stay, the British want to leave. Holding the eastern end of the Allied line, the British held the worst position and suffered more than others from disease. In August, they began to pull back and redeploy two divisions to Egypt and Palestine. By 1917, they could be replaced by other Allied troops, including the Greeks. Having fled Serbia after the defeat of the country's defeat in 1915, the Serbian Army held the Allied line west of the Vardar River. During the year, the Serbs tried and executed Apis — Dragutan Dimitrijević — and two others charged with conspiring against the Serbian government in exile. As the Chief of Intelligence of the Serbian General Staff, Apis had been active in Union or Death, a secret society also known as the Black Hand, that sought a greater Serbia that included Bosnia-Herzegovina, and that had played a role in the 1914 assassination of Franz Ferdinand and his wife that had led to war. Also in the line were, Russian troops had landed in Marseilles, France on April 20, 1916. The revolution in Russia extended to the army overseas, which included revolutionaries. Russian troops had already mutinied in Marseilles on September 1, 1916, killing a colonel. Russian Minister of War Kerensky's changes extended overseas where soldiers stopped saluting officers and some Russian troops were imprisoned. Italians held the left wing of the Allied line. Italy was ambitious for land along the eastern side of the Adriatic Sea and for the Dodecanese, islands in the Aegean off the Turkish coast. From west to east, from the southern Adriatic across the top of Greece, crossing the border at Monistir (captured in 1916), were Italian, Serbian, Russian, French (including a Montenegrin brigade), and British troops. Those Greeks fighting with the Allies took over the Allied right wing from the British. Arrayed against the Allied forces were those of the Central powers, mostly Bulgarians with some Turks in the east, but also with German troops and officers. On August 18, a fire, apparently accidental, broke out in Salonica and burned through the 19th and 20th. Much of the formerly Turkish city, where the Young Turks had planned the revolution of 1908, was destroyed. On December 10, General Sarrail was replaced by General Guillaumat who began building the infrastructure for an attack. The Zeppelin had proven to be a problematic weapon, greatly subject to weather conditions, and one against which the Allies had deployed improved defenses in anti-aircraft guns, airplanes, and explosive and incendiary bullets. Germany turned to large bombers such as the Gotha machines capable of reaching London with a substantial payload. The French Spad XIII entered the war in May, 1917, a fast, powerful fighter. On September 11, the great French ace, Georges Guynemer was killed. 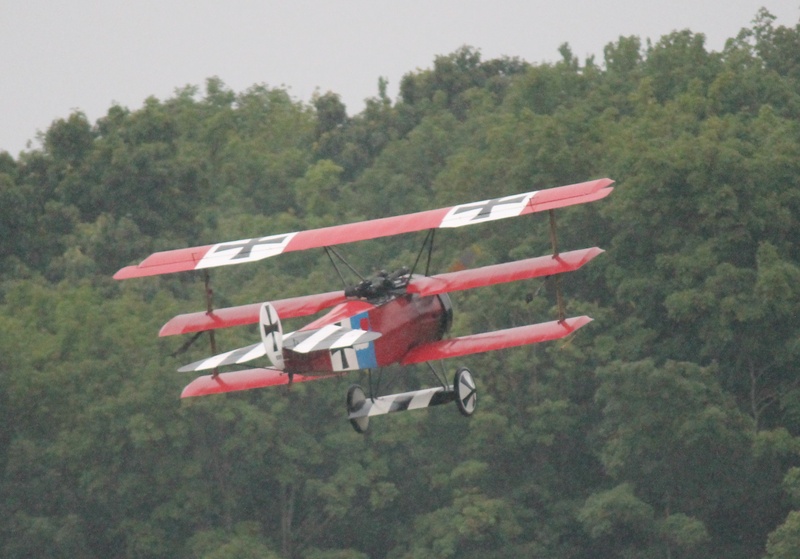 Introduced in October, 1916, the Fokker Dr.I triplane quickly became a favorite of German pilots including the country's greatest ace, Manfred von Richthofen. Willy Coppens, Belgium's greatest ace, began flying in 1917. As in 1916, there were calls from some quarters for peace. With the United States declaration of war, President Woodrow Wilson was no longer one of them. At year's end, British Prime Minister Lloyd George and the new French Prime Minister, Georges Clemenceau promised total victory with the defeat of Germany by its primary adversaries France and Great Britain. All else was secondary to its being driven of France, perhaps in 1919, possibly 1920. Germany’s great enemy was Britain, master of the seas, and thwarter of Germany’s colonial ambitions. Russia, if it stayed in the war at all, could fall back 50 miles or 200 miles and regroup. It mattered little. As long at the Russians are kept from the Carpathian mountains, gateway to the Hungarian plain, there was little to be feared.